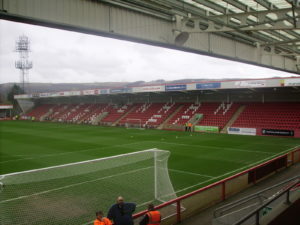 Address: Whaddon Road Stadium, Whaddon Road, Cheltenham, GL52 5NA. Up to 1,100 Swans fans are in the Hazlewoods stand behind the goal; the view of the pitch, leg room and facilities are good. The food options are decent; burgers, half pounders with cheese, hot dogs, gourmet pies, bacon rolls, Cornish pasties and sausage rolls. The bar at the ground (Robins Nest) lets in away fans for a £1 entrance fee. Cheltenham is a nice place to visit and because of its racecourse there are plenty of places to stay. I’ve been to the Battledown (GL52 6ST) a very pleasant B&B. There are many other such places along with a Hilton, The Big Sleep, Holiday Inn Express, Jurys and Malmaison. The Brewery quarter offers the multiplex Imax Cinema, bowling alley and many high street branded restaurants. Cheltenham has a continental café culture during the day, and a busy nightlife scene as the sun sets, whether you enjoy dancing, theatre or music. The ‘Parklands Social Club’ (GL52 5PR) is a good bet for a pint. Parking is available there for £4. ‘The Sudeley Arms’ (GL52 2PN) and ‘The Feathered Fish’ (GL52 2NW) with a decent fish & chip shop between them. The Feathered Fish does any 2 burgers, chips and coleslaw for £10 on Tuesdays. The town centre has pubs, bars and restaurants of all types. There’s no car park at the ground and limited street parking. There’s a free ‘Park & Ride’ (10 mins) to the ground from Cheltenham Racecourse, signposted around the town. Buses leave every 20 minutes from 6.00–7.20pm, and return to the car park at 9.45 pm, 10.05 pm and 10.25 pm. Cheltenham Spa station is 2.5 mile away. The “D” Bus runs from the station car park 6 times an hour in the day and 3 in the evening. It takes you to the town centre then a 15 minute walk, the less frequent “A” Bus goes directly to Whaddon Road. A taxi is around £10.